So you’ve learned lots of chords and scales, you’ve developed a decent sense of time, and you have a nice armoury of phrases to use in improvisation. But how does all of this actually sound when you play? Arpeggios are the notes that make up a chord when played in succession, as oppose to at the same time. They are just as valuable a resource for creating music as scales are, and in a way arpeggios are mini-scales of just three or four notes. There are as many arpeggios as there are chords but in reality, we only need to learn a moderate number of them in order to meet most requirements. So, which arpeggios should guitarists learn? So you’ve been playing guitar for a while and you want to play music with other people. In this article we’ll look at some of the different approaches of how to get in a band. Do you want to play original music or covers? Do you want to start a band of your own or join one that’s already established? Do you already have songs written? 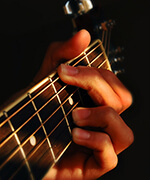 If you’ve been playing guitar for a while the chances are that you’re interested in doing gigs. It’s great to get up and perform music in front of people, both from an entertainment point of view and because it’s a landmark in your guitar playing ability.